My name is Hayden and I am 16 years old. 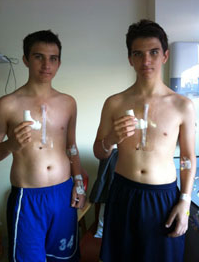 Myself and my identical twin brother Isaac do not have Marfan’s Syndrome but our aortas were showing signs of dilation. Our consultant at St.Thomas’ Hospital had no idea why other than it being something we generated between ourselves being identical twins. We have had this problem since birth. We had the procedure done at the Evelina children’s hospital just twelve days after our 16th birthday, on the 1st of July we had gone to St.Thomas’ hospital for all the pre-op tests and then had the procedure on the 2nd of July 2013. We were allowed to chose who had the procedure first, but as neither of us said we wanted to I decided, being the older twin, that I would go in and have the procedure done first, first thing in the morning, and then Isaac followed straight after. When it came to the day of the procedure, Isaac and I weren’t really scared about it but we were quite nervous, Isaac more than me. Before we had the operation Mum and Dad explained that we would be put to sleep, cut open and have our chest opened but not knowing much about operations and all, we didn’t really know what to expect. Neither of us remembers much about the time we spent on intensive care, but one thing I do remember was knowing without seeing that Isaac had just come in to intensive care, and as soon as he came in I asked my dad ‘is he alright’, also another thing I remember was being sat up and seeing Isaac’s chest before I had even seen mine and saying ‘is that what I have on my chest as well?’. In intensive care we had a morphine button we could press to reduce the pain. The next day we were moved to the high-dependency unit on the children’s ward. All of the nurses were very nice on intensive care and the ward. By that evening when we were on the ward they had already got us standing up so that we could use the toilet, and by the next day we were out of bed going for little slow walks up and down the ward. Our surgeon came to see us a few days after the operation and was really pleased with our progress. We had the operation on the Tuesday and then they discharged us on the Sunday. All the staff were so lovely and we couldn’t thank the medical staff enough. The scars are healing very well and don’t look as bad as I thought they would. Isaac and I have always been sporty and we cannot wait to get back to playing basketball again and we will also be going to college in September.